François Schuiten, in consent with Benoît Peeters, has donated the majority of the original masterpieces to the National Library of France (Bibliothèque nationale de France) and the King Baudouin Foundation (Fondation Roi Baudouin). This news was confirmed by the spokesman of the Foundation. The designer has created a fund within the KBF to ensure the sustainability of his work and ensure public access 1). Through this donation, François Schuiten solved any problems in future succession and ensures continuity of quality prints of his works beyond current technological developments. The King Baudouin Foundation accepts this gift with gratitude. She agrees to keep the François Schuiten Fund alive in collaboration with the Bibliotheca Wittockiana in Brussels to whom she entrusted the deposited works. Also the pages and material used for the books François Schuiten made with Claude Renard and his brother Luc Schuiten will be part of this special fund of the King Baudouin Foundation. To celebrate this unique gift the National Library will have a seminar on the Obscure Cities series at April 11th, 2013. Also Maison Autrique, the Centre belge de la Bande dessinée, le Centre de l’Image de La Louvière and the comic museum of Angoulême will receive certain parts of Schuitens work. The images made under external control and integrated later in the albums and any other drawings (scenography, posters & boards) remain the property of the family. According to Le Soir 4) Schuiten and his relatives have confident in this approach. “In times when prices of originals reach exorbitant heights, this shows that not everything can be bought in the world of comics”. 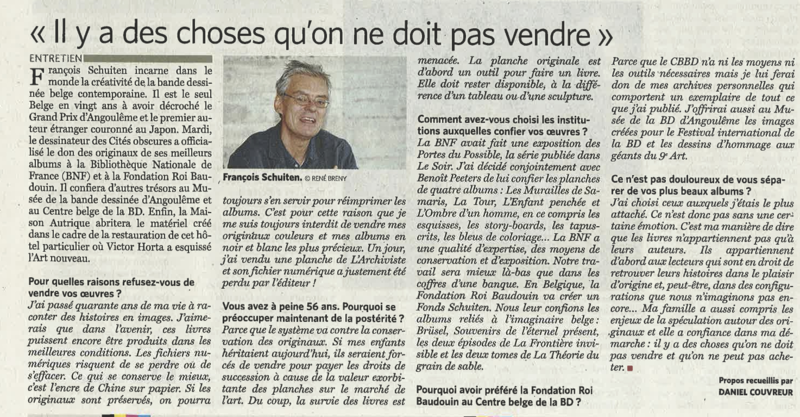 François Schuiten and Benoît Peeters have been thinking about this donation already for years. It took some time to make it work. The National Library of France and the King Baudouin Foundation were chosen for the links and experiences Schuiten and Peeters had with both before. the press publication by Casterman. This blog post was created on 2013-03-26 at 13:52 and last modified on 2018-02-11 at 11:40 by Joseph Le Perdriel.